Cassandra Sciortino is the scientific organizer for the panel on Art as Cultural Diplomacy – a regular part of various Euroacademia international conferences. Cassandra Sciortino earned her BA degree in art history at the University of California, Berkeley. She is a PhD candidate at the University of California, Santa Barbara in the Department of the History of Art and Architecture. She was a Samuel H. Kress Pre-Doctoral Fellow at the KunsthistorischesInstitut-Max Planck-Institut in Florence and is completing her doctoral dissertation, based in Berkeley, California. She has lectured in art history at the University of California, Santa Barbara, Pratt Art Institute’s program in Italy, and The Berkeley Institute. She regularly teaches a course on cultural diplomacy to undergraduate and graduate students at MCI Management Center Innsbruck in Austria. In addition to her regular panels at Euroacademia’s international conferences, she has lectured on art as cultural diplomacy at the Institute for Cultural Diplomacy in Berlin, at the University of Istanbul, and in Berkeley, California. She has presented her work in art history at numerous academic conferences in the USA and Europe. 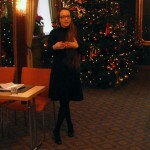 She has published academic articles on the history of art in nineteenth-century Europe and is currently preparing an edited volume on art as culture diplomacy in Europe.